The petition is aiming to collect a total of 150,000 signatures. Source: Twitter/Sunrise. An online petition has been launched calling for Channel Seven presenter David ‘Kochie’ Koch to be given the boot after he clashed with Pauline Hanson during a live debate earlier this week. The Sunrise host clashed spectacularly with the One Nation leader on Monday’s episode of the popular breakfast show, with Kochie asking the Queensland Senator if she “felt complicit” in last week’s terror attack in Christchurch, New Zealand. As of Wednesday morning more than 96,880 had signed the petition which accused Kochie of an “appalling attack” on Hanson and labelled him a “simpleton”. “This morning attack on Pauline Hanson by ‘Kochie’ and Derryn Hinch was appalling,” the petition reads. “You’ve let this moron run his mouth for way too long. 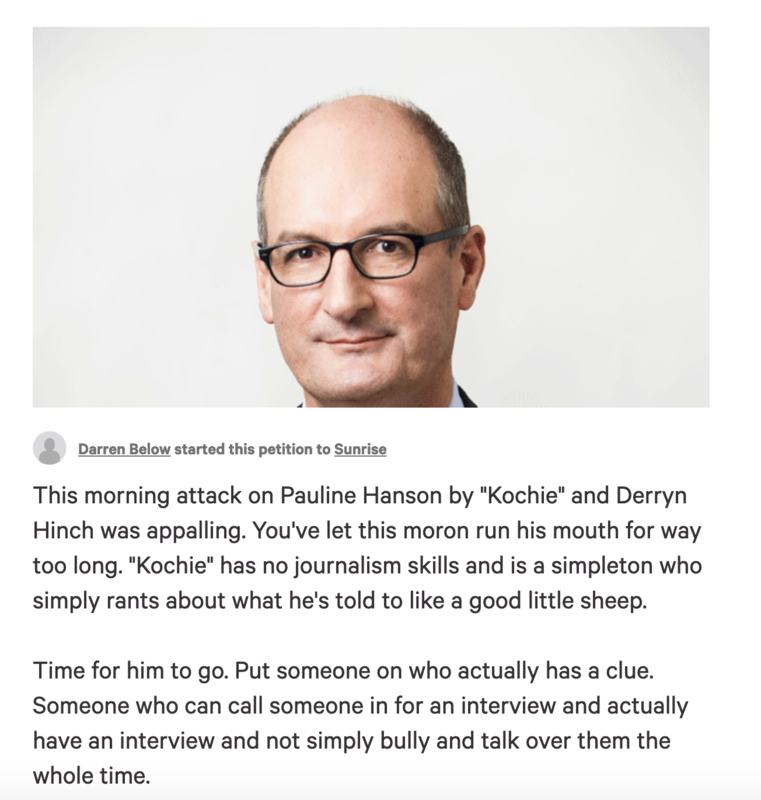 ‘Kochie’ has no journalism skills and is a simpleton who simply rants about what he’s told to like a good little sheep. Almost 100,000 people have signed the petition so far. Source: Change.org. The Queensland Senator appeared on the morning TV show on Monday morning, when Kochie broached the topic of One Nation’s “anti-Muslim policy” and suggested the beliefs held by Hanson’s party could “empower white supremacists”. Following the televised row, Hanson took to social media to share two videos after Kochie and Hinch failed to “allow her to answer on Sunrise”. She said: “Your comments are suggesting you thought I was being bullied and I was shut down. It was an ambush. Well I felt that way too because I haven’t been able to explain myself properly and answer the questions. She continued: “I challenge, has David Koch or Derryn Hinch actually read my immigration policy? They’re quick to criticise me but when I get out and I speak to people, I know how you feel because I feel exactly the same way. What are your thoughts on this story? Do you think Kochie attacked Pauline Hanson or was it a fair debate?